Posted September 1, 2015 by eventreb & filed under Event Apps, Event Marketing, Event Networking, Event Rebels Blog, Social Media. I’ve written about live streaming apps Meerkat and Periscope before. Live-streaming has been the new frontier of social media since Meerkat blew up at SXSW earlier this year. 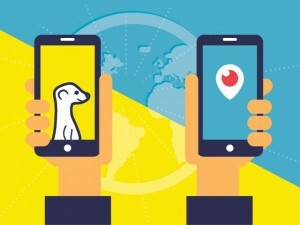 For the most part Meerkat and Periscope have been the go-to livestream apps, and they’ve been successful in terms of introducing the livestream to the mainstream. 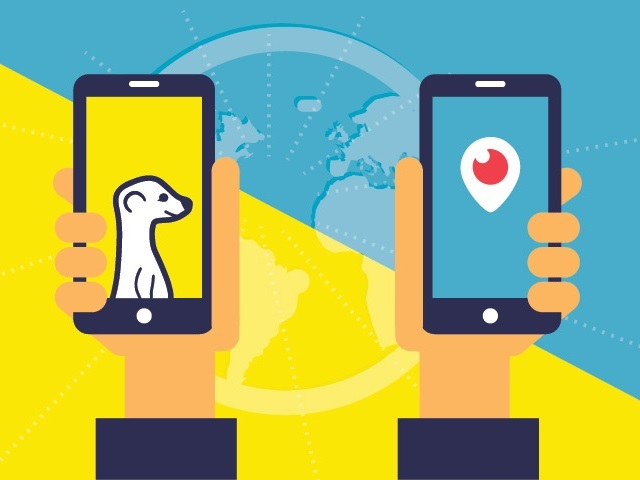 According to Salesforce, Meerkat currently has around 2 million users, and Periscope has around 10 million users. Neither app has taken the world by storm like Facebook, Twitter, Pinterest and Instagram have, however that may all change. There’s a new kid on the block, and it’s name is Blab. “Sit and watch syndrome” is that feeling you have at the end of your day, where all you want to do is sit on your couch in front of the tv and turn your brain off for the day. The TV simply becomes background noise. With the introduction of smartphones, even the TV can’t compete with distractions. It is why so many shows have introduced the second screen experience. The problem you run into with Periscope and Meerkat is, there are no second screen experiences. It really does become a “You talk, I listen,” experience. Sure Periscope and Meerkat have conversation in the comment stream, but in a busy stream it can be hard to respond and focus. For the majority of livestreams on both platforms, the experience does end up being a broadcast. Broadcasts absolutely serve a purpose. It’s just important to know when to use them. Here’s a handy chart to further explain the difference between broadcasting content and content that engages. Alright, enough about broadcasting vs. engagement, I’ll tell you what you want to know! What in the world is Blab!? Blab is a Brady Bunch style, 4-way video streaming website and app. So, is it just 4-way Periscoping? Not quite. On the right of the page is a live chat stream with the viewers. If your goal on social media is to reach an audience that is really interested in similar topics, Blab will boost your following with real organic connections. After a Blab go connect and comment on viewer’s posts. Thank them for comments and being on your show. This is a close as you can get to face to face communication with people from around the world. It’s also a great opportunity to reach a new audience who may be interested in what your event has to offer. So, how can event planners and marketers utilize Blab for engagement? I’m glad you asked. Know Before You Go – A lot of conferences have “know before you go” PDFs, email blasts, and sometimes even a webinar. With Blab you can schedule a know before you go and invite all of your attendees. Pick a host/moderator, and one or two conference experts. Leave the 3rd and/or 4th “seats” for attendees to jump on camera and ask a question. As a host, make sure you watch the comment stream for questions as well. Speaker/Panel Sneak Peeks and Follow Ups – Do you have a great keynote speaker who is open to engage with your attendees before or after the program? What about a panel of experts who could talk for hours? You’ve got two options with Blab. You could host a sneak peek livestream for your speakers to give an unscripted introduction to their sessions and answer some questions from your attendees, or even interact with other speakers. Don’t have enough time to finish a panel conversation during a session? Schedule an after-conference follow up on Blab for your panel to answer an outstanding questions from the attendees. These can also be recorded and embedded on your event’s website for those attendees who can’t make it. Face to Face Feedback – Curious what your attendees really think about your conference? Give them an opportunity to voice their feedback in a Blab focus group. Invite your attendees to participate post-conference and really hear what worked and what could be improved for next year’s conference. Press Conferences and Town Halls – Why waste your leadership’s valuable time at the conference, when you could hold a press conference or town hall on Blab? Blab is a great opportunity to invite the company’s leaders to interact Face to Face with members and media. Behind The Scenes Broadcasts – Technically you could broadcast a behind the scenes video of a General Session from Periscope or Meerkat, but with Blab you can give your online viewers a new perspective. 4 to be exact! Show your attendees what it’s like to be watching the stage, while also showing them what’s going on in the DJ booth, the Green Room, and backstage. All at the same time! These are just a few examples of the wide array of possibilities Blab offers to engage with your attendees in new and meaningful ways. Go ahead, try out Blab yourself!